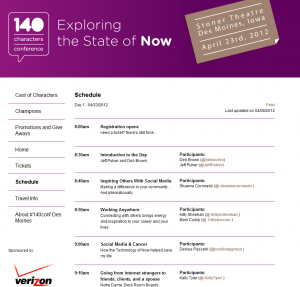 Looking Forward to an April Trip to Iowa for #140conf! - JP loves LIFE! It is a conference where you go beyond Twitter to really get to the people who participate in the online discussion world. There is a steady stream of real people telling their wow moments, their day-to-day, their dreams, etc. Everyone gets the same 10-15 minutes to talk about their topic. The organizers welcome presentations and then organize the topics of interest in the area where that conference is held. So in LA you would have more entertainment than agriculture. Its all about people and community, understanding each better and improving ourselves along the way. I learned so much from the one in Hutchinson last fall that it amazed me. The 140 Characters Conference, aka #140conf, takes online interaction and turns it into an in person conference. The State of NOW is made up of immediate communication tools like Twitter, Google +, Facebook and many others. The 140conf explores how the State of NOW is disrupting business, education, agriculture, media, celebrity, music, politics, public safety, and our culture. Presentations are 10 or 15 minutes long, and PowerPoint is not allowed. Much like a Twitter message, speakers have to get to the point. It’s not a how-to conference. It’s an idea conference. “Rather than leaving with a bunch of tips, tools, and systems, I left with a bunch of ideas, concepts, and connections,” 2010 attendee and speaker Scott Wendling said. It’s about serendipity, more than business cards. It’s about the hybrid vigor of ideas that happens when people from different industries or different worlds get together and come up with something new. Cotton, Kansas, & Coca-Cola: Results of Sharing My Passions is where I shared the presentation I gave, my story I shared . We are nearing the #140conf in Des Moines! Last year I wanted to get there but couldn’t. This year I made sure to hold the date as soon as it was announced! And I decided to do something different. Rather than telling my story solo, I asked my dear friend and Missouri farmer Chris Chinn to do a panel discussion with me. I’ve been pumped for various reasons along the way — Chris agreeing to go, our getting accepted, seeing that other farmers will be on-hand, etc. And this week, I got a glimpse at more reasons to be pumped! Deb Brown of DebWorks is heading up the event! She rocks! Education is one of the bigger areas of discussion and Angela Maiers is going to help lead the conversations here. I met her forever ago on #blogchat…. have to tell you I’m pumped about finally meeting her. I have several new faces in the education line up, one I’m really interested in hearing from is Adam Hartley who will be talking about how technology can bring the whole world into the classroom! I may have to dust off my own Flat Stanley project that helped bring so much of my social media world to my nephew’s class! Business — The person leading up the business section is someone I met more recently Josh Fleming, who leads digital strategy at an advertising agency in Iowa. They seem to choose to have fun with work. Gotta like that! Grant Griffiths is one of the folks in this section I’ve followed a long time, I look forward to hearing from him about thoughts on WordPress… Wonder if he’d look at my new effort here. And I don’t know Liz Nead yet, but her 30 Days of You sounds like it will be fun to learn about. I’ll be presenting in the agriculture session Shannon Latham is coordinating. Haven’t met her yet but feel like I’ve known her a LONG TIME! She’s with a family seed company in Iowa so I hope we get some time to visit! I will be trying to visit with several people in this session! Larry Sailer is a friend I finally met a couple of years ago – can’t wait to hear how he’s using technology on his farm! 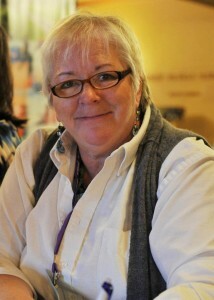 Social media hero Judi Graff will be talking about getting more farmers to blog. Heather Lilienthal will probably laugh but I still remember her by some boots that used to be in her avatar! She works at Iowa Farm Bureau and gets to be involved with agricultural communications on the state and local level. I don’t know Darcy Maulsby very well but she brings marketing and a family century farm to the conference… we will enjoy what she offers. Food is also on the agenda and Patrick Palmer is the computer guy will be leading a panel of folks from restaurants in talking about use of Twitter. Shawna Coronado is a new name but maybe she can give me tips for the raised bed that is out of control as she’s really into gardening. There are a couple of authors and I’m thinking I’d enjoy chatting about travel with Jennifer Wilson — maybe Croatia should be on my near-term list! Kind of intrigued by what Bernadette Boas will have to say since her website is http://www.sheddingthebitch.com. There will be travel talk with Jody Halsted who I connected with recently. She’s got a lot of background on traveling with a family. My long-time social media friend Tara Litzenberger will be talking about her personal social media experience. And a final familiar face on the current list is Gigi Belmonico. The fine folks in Des Moines have posted the schedule for the event! We will be running hard and fast all day! I’ll plan to get there around 8 a.m. and leave after 5 p.m. Check out all the incredible people that will be speaking and the stories they will share! So glad to hear you will be visiting Iowa. Don’t think I will be able to attend the conference (blame law school) but we should definitely get together for coffee or dinner while you are in town! What a great post! I’m also a Chris Chinn fan and look forward to meeting both of you on Monday.